Trastevere, which literally means “beyond the Tiber”, is beyond doubt one of Rome’s most famous and characteristic zones. It’s valued equally by me, Romans and tourists that fill up its contorted alleys during the day, but gets especially vivid at nighttime, when all of Trastevere’s pubs come alive, helping people to socialize. Right in the heart of this marvelous neighbourhood there is one of my dearest spots in Rome. Though we are only talking about a square here, in my opinion you are almost guaranteed to pass a fun evening here. Just imagine the following scene: You walk over one of Rome’s prettiest bridges, namely”Ponte Sisto”, and just when you passed its highest point you’ll see a beautiful square up ahead from you, at which top end there are a few stairs leading up to an elegant little fountain from the 17th century. 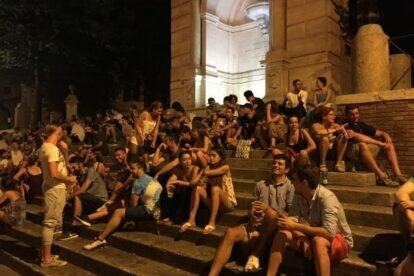 Sitting on those stairs, but also standing everywhere in Piazza Trilussa, are crowds of young people talking, drinking and having a good time. Most of them will have some beer or wine with them, bought at one of the small stores around the square, and there is almost always the indispensable student with his guitar, adding that little extra atmosphere. Another element I enjoy very much is the balanced mix between locals and travellers frequenting Piazza Trilussa. Plus, once you’ve sat down with(or without) your bottle of Chianti on the stairs, you will have a stunning view on the Tevere river opening up in front of you.